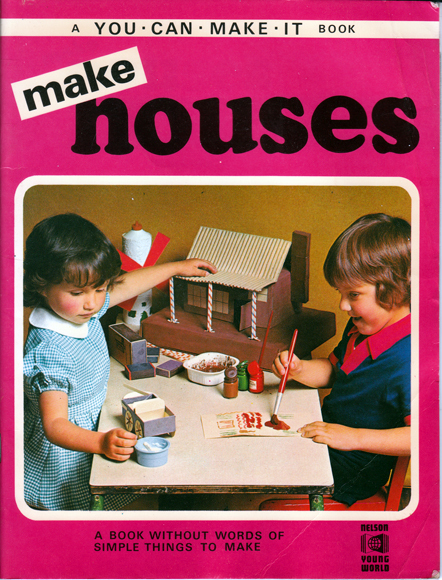 Description: Rare, wordless book featuring photographic instructions for creating 11 different types of home using poster paints, the obligatory PVA glue, and various card and plastic packaging – the ranch house (featured on the front cover) is particularly good, as is the log cabin which uses real twigs for logs! Glazed pictorial covers are creased (refer to image). The pages are a little wavy from damp – one or two have negligible staining – and there is some very minor damage to one of the pages where it was stuck to the other. Otherwise, all are in very good, unmarked condition. Measures 24 cm × 18.5 cm (9.5″ × 7.4″). Oversize 8vo. Unpaginated.